Universitas Tonji Shanghai membuat rumah bambu bertenaga surya. Panel surya pada atap dan dinding rumah tersebut menghasilkan daya listrik sebesar 9 kW. Rumah dengan satu kamar tidur dan satu ruang tamu tersebut dirancang dengan menggabungkan arsitektur bangunan khas Cina dan teknologi terkini. Ia memiliki sistem kendali suhu dan kelembaban, sistem isolasi panas, dan taman berdinding bambu. 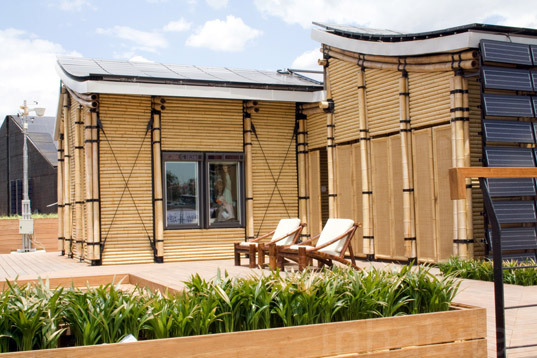 Tonji University Shanghai’s Bambu House at the European Solar Decathlon is a beautiful sun-powered abode inspired by nature. 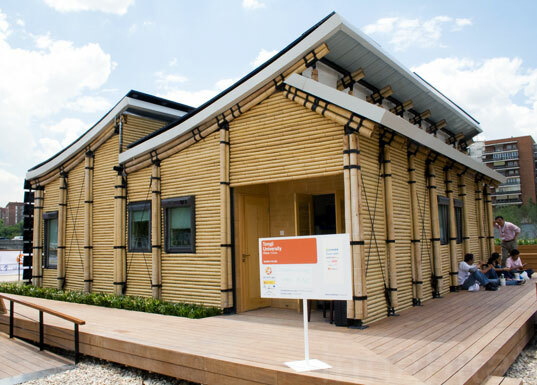 It has two elegant sloping roofs and is almost entirely constructed from bamboo. Its impressive solar array generates 9 kilowatts of electricity which powers its one bedroom, one living room layout. We love how the house combines traditional Chinese architecture with state of the art technology — it has temperature and humidity control systems, high-level thermal insulation systems, and a bamboo enclosed garden. Tonji University’s team has 20 members and is composed of doctors, postgraduates, and undergraduate students who range across many disciplines — from architecture and urban planning to energy development. They hope that their solar-powered house can help promote their forward-thinking ideas about renewable energy use in residential urban areas. The team has spent six months designing and constructing the house from scratch and they are hoping their hard work will pay off. Structurally, the house is strongly influenced by traditional Chinese architecture but with a tinge of the efficient look of contemporary architecture. The Solar Decathlon Europe kicked off with a bang today and Inhabitat is on the scene to provide a first peek at the amazing sun-powered architecture on display. The European Solar Decathlon is the sister of the US Solar Decthalon — which we covered in Washington DC this past October — and was organized in a partnership between Government of Spain’s Ministry of Housing and the United States Government. The decathlon is taking place all through next week in Madrid, so stay tuned to Inhabitat as we bring you a front seat view of all the action!